I wish to extend my warm and heartfelt gratitude to the Catholic church for the excellent service that you have relentlessly provided for the citizens of the country. Because of your contribution, together with other faith-based organisation, the country has recorded impressive achievements which have been recognised the world over. Our small Kingdom is now part of the global discussions on HIV and AIDS due to the success achieved in the response to the epidemic. I further note with heartfelt gratitude the Church is further in communities supporting food security and livelihoods interventions, psycho social and counselling services amongst others including the delivery of these services through incorporating of the rights- based approach in programming, which ensures that services are delivered as part of the basic right to health. These interventions are delivered in support of the broader social sectors whose mandate is alleviating the social impact of HIV and AIDS on vulnerable and hard to reach populations. As I end, Programme Director, allow me to finally enlist continued collaboration with the church and confirm that this partnership has made significant dent in the country’s response to HIV and AIDS. 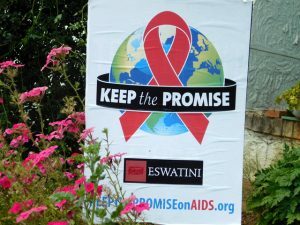 Together let’s commit to ending AIDS. I Thank You.